Eat less, exercise more. Now there is new evidence to support adding another “must” to the weight-loss mantra: eat at the right time of day. 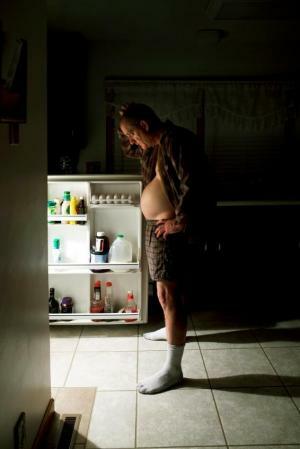 A Northwestern University study has found that eating at irregular times — the equivalent of the middle of the night for humans, when the body wants to sleep — influences weight gain. The regulation of energy by the body’s circadian rhythms may play a significant role. The study is the first causal evidence linking meal timing and increased weight gain. The findings could have implications for developing strategies to combat obesity in humans, as the United States and the world battle what has been called an “obesity epidemic.” More than 300 million adults worldwide are obese, including more than a third of American adults. Details of the obesity study, which was led by Turek, will be published online Sept. 3 by the journal Obesity. Over a period of six weeks, both groups of mice were allowed to eat as much high-fat diet as they wanted during their daily 12-hour feeding phase. (Much like many humans, mice have a preference for high-fat food.) Since mice are nocturnal, the 12-hour feeding phase was during the day for those fed during normal sleeping hours and during the night for those fed during naturally wakeful hours. Food was not provided during the other 12 hours of their day. The researchers next plan to investigate the molecular mechanisms behind their observation that eating at the “wrong” time can lead to weight gain. In addition to Turek and Arble, other authors of the paper are Joseph Bass, Aaron D. Laposky and Martha H. Vitaterna, all from Northwestern.